This very nice couple from San Francisco started had their reception at the exceedingly elegant and beautiful New Orleans Museum of Art. But first, their wedding day celebrations with a joyful Tisch and Ketubah signing at the Westin hotel, with them seeing each other for the first time that day just before the beginning of the latter. We then headed over to City Park, where the ceremony took place in the gardens next to Pavilion of the Two Sisters, with the Chuppah and beautiful decorations provided by Urban Earth. Dr. Jazz led the couple and guests on a festive Second Line around the grounds, which everyone really enjoyed. After the cocktail hour, we moved over to NOMA for the reception. Dr. Jazz showed their versatility, having performed for the ceremony, the Second Line, the cocktail hour, and now the beginning of the reception for the traditional Hora dance, which was wonderfully chaotic (as they usually are!). New Orleans legend Kermit Ruffins and his band then took over for the rest of the reception. 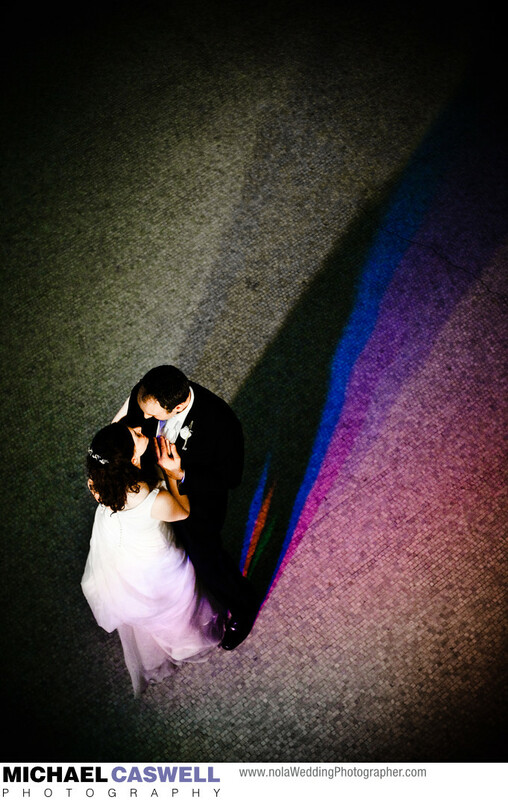 This photograph was shot from the balcony as the couple danced below, with the lights from the band casting a visually interesting series of shadows behind them. At the end of the night, Amy and Andy were given a fantastic departure with sparklers... these are sometimes difficult to coordinate, but the Unique Weddings in New Orleans team did a great job with it, as they did with all the other aspects of this wonderful wedding.